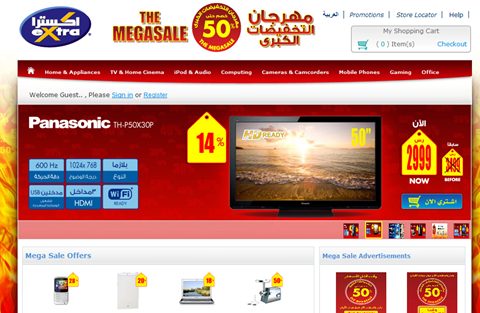 An information just came in from one of our readers, eXtra Store at Saudi Arabia is having their Mega Sale from October 25th to October 31. Just make sure to use your Credit Card wisely and do not be an impulsive buyer. Bought items in this store for several times, but two times i have been given an item that was obviously damage. (Not working normally). The last item was buying the new IPod(3)and seem to be not charging normally and taking more than ten hours. It was a really time consuming on taking it to the store then forwarded to the Apple warranty shop that took another several days for us waiting, and at the end of the day the item that was repaired was still not working with the same issue. I’m sure the money I paid has no damage, but EXTRA have no quality control upon selling such damaged items. I’ve visited Extra near Ikea, and the store is very crowded. We ended up buying nothing, because we were expecting higher discount on iPhone. Previous story Jarir is Now Accepting iPhone 4s Reservation | Over Priced?